All is lost. The Dreamfinder is gone! And in his place is the Doubtfinder has taken his body. 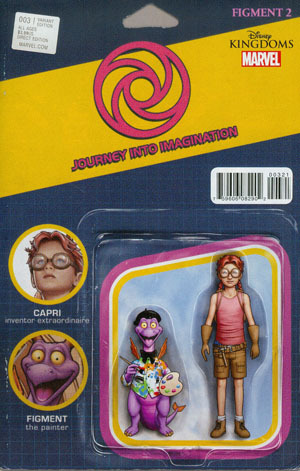 Figment goes on the run and finds himself a new dreamer, the formerly introduced Capri, who not only wishes to enter the school made famous by Blair Mercurial but also has a secondary connection. Capri and Figment attack the Academy Scientifica-Lucidus to face-off against the Doubtfinder, finding a new ally on the way. Figment 2 #3 is the passing of the dreaming torch. Dreamfinder is lost, and a new Dreamfinder is needed. In this case Capri steps forward giving us a payoff to her earlier introductions. And this young lady has a spark of adventure merged with her dreaming. She is truly a fine heir to Blair Mercurial which is made even better by the fact that she's not giving up on the original dreamer yet! 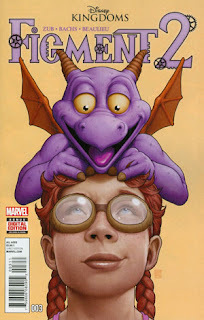 Jim Zub as writer continues to build the fun of dreaming and captures the spirit of the Dreamfinder character even while passing the torch onto a new hero. Ramon Bachs includes some great Easter Eggs, including the redecoration of the Academy with some images that will delight Disney animation fans. Figment 2 continues to be fun adventurous all-ages adventure. The use of Capri puts a strong female dreamer into the front of the story, but even young boys can cheer for this hero. The story, while also being all-ages, is also dark and action-packed. But one must remember while still in darkness there is hope and perhaps doubt can be overcome!